As part of your Gilman Scholarship application, you will write two essays. The first is a statement of purpose where you have the chance to explain why you need the scholarship and how it will impact you. This is where you get to let your personality shine though so the scholarship committee gets to know you. The second essay is a follow-on service proposal. 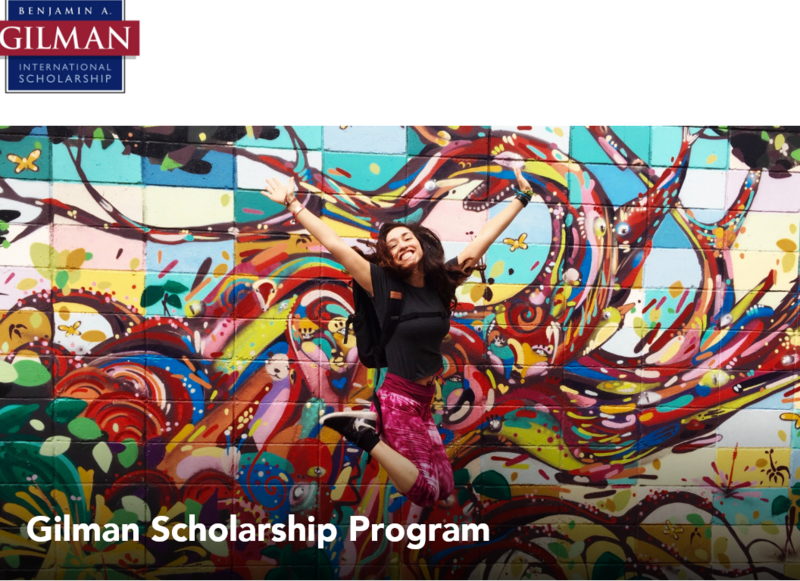 As a Gilman Scholar, you get the opportunity to give back to the community, promote study abroad and the Gilman Scholarship, and make an impact on others who may be in situations similar to you. This is a really unique and personal way for you to pay it forward. The scholarship committee is going to read thousands of applications. You need to let a bunch of strangers get to know you, leave a lasting impression, explain where you want to go and why you need this scholarship in less than 7,000 characters. Show, don’t tell, a personal anecdote that gives background on who you are and why you should get this scholarship. Leading your essay with a story is way more interesting than blabbering on about “me, myself and I” the whole time. Your creativity will make you stand out. Research the location where you want to study. Discuss what you can learn in the location you have chosen that you can’t learn at home because of the country’s politics, history, location, and so on. Try and settle on a few specific points that you can thoroughly discuss. Start your essays early — I worked on mine for almost two months! You don’t want to start late, realize the deadline is closer than you thought and not have the time to give it your all. When you read out loud, you will stumble over any sentences that don’t make sense. This is my favorite way to make sure my sentences flow and to catch grammar or spelling errors. It will help your writing become more conversational and readable. I annoyed all of my friends into reading my essays and giving me feedback. A new set of eyes will help catch any small mistakes you miss from staring at your essay for too long. As a good rule of thumb: if someone else doesn’t understand what you are talking about in your essay, you need to revise it because neither will the scholarship committee. Ultimately, the goal of the service project is to promote the Gilman Scholarship. If you propose a service project that is important to you, that will passion will be a lot easier to convey in your essay and you will enjoy your time following up on your proposal. I chose a project that would reach out to students who may be in similar positions as I was because study abroad and the Gilman Scholarships are opportunities that I wish I had known about early on. They made a huge difference in my life and I wanted to pass this knowledge and opportunity on. A large part of the selection process revolves around your follow-on service proposal and how well you can promote the Gilman Scholarship. The scholarship committee wants to see that you have really thought through your service project. If you can state the names of people you plan to work with, dates and other specifics, it shows you’ve actually planned out what you are going to do. Also, if you have any special skills or talents that you can use to promote the Gilman Scholarship, use them! This is another opportunity for you to get creative and propose a unique project. 7,000 characters sounds like a lot, but with the amount of information that you need to get across, it ends up being challenging. In the end, it’s a lot easier to write too much and have to cut your essays down than to realize you need to add more substance. Also, I find that the more I write, the better ideas I have and it’s easier to get creative.